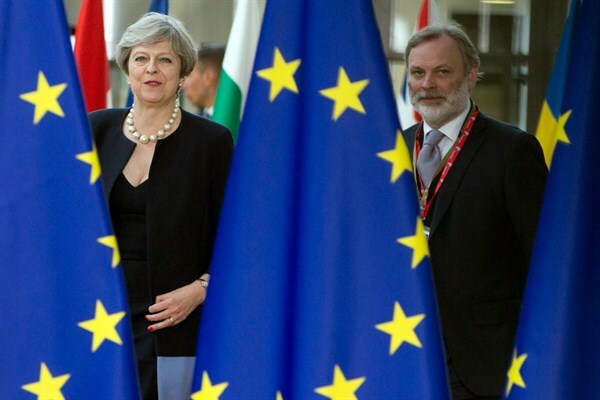 As the Reality of Brexit Sinks In, There Are No Good Options for the U.K.
British Prime Minister Theresa May and U.K. Representative to the EU Tim Barrow at an EU summit, Brussels, June 22, 2017 (AP photo by Virginia Mayo). What a difference a few months can make in British politics. In early May, a confident Prime Minister Theresa May looked well on her way to securing a much bigger majority for her Conservative Party in the House of Commons on a platform of “strong and steady leadership” and a promise to deliver on Brexit. Jeremy Corbyn’s Labour Party looked out of touch with the real concerns of most British people and seemed destined for electoral oblivion.